O Canada. What sparked Vancouver’s riot on Wednesday, which followed the defeat of its Canucks ice hockey team to the Boston Bruins in the decisive seventh game of the Stanley Cup? In a crazy four hours the city’s reputation as a tourist destination - earned with the successful staging of last year’s Winter Olympics - was trashed. So much for Vancouver consistently topping the Economist Intelligence Unit’s annual poll of the world’s most liveable cities. In the analysis of the looting and attacks on property (and some unlucky people) in the days since the riot, the North American media has been unable to come up with a coherent explanation for shameful scenes last witnessed in the city in 1994 under similar circumstances. The Vancouver Sun alternates anarchists, drunks, hooligans, vandals, and most painfully, fans in describing the culprits. The New York Times applied its journalistic insight and told readers: “According to eyewitnesses, the rioting was instigated by young men who were intent on starting violence.” D’oh! Political and economic tension is regularly igniting riots in mainland Europe. In the Middle East challenging authority is costing lives. Recently in the UK there have been minor disturbances where troublemakers have exploited genuine grievances of mainly the young. 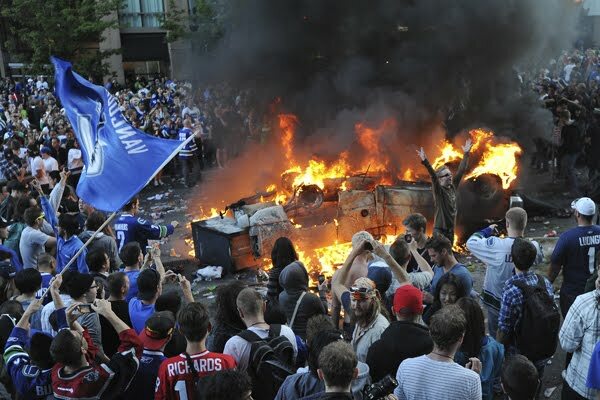 So there has to be something seriously amiss in Vancouver youth if a lost ice hockey game can trigger rioting. In the UK there are fights between rival football gangs – and serious sectarian violence in Scottish football. Thankfully full-blown riots – confrontations with the police and wanton damage - are rare. The norm is more how Manchester United fans accepted the best team had won when the club was beaten 3-1 by Barcelona in last month’s Champion’s League final at Wembley. Vancouver officials are still blaming anarchists and criminals for the trouble. If so, a lot of them had gone to the expense of buying Canucks' jerseys seen in the news clips beamed around the world . Apart from boxing, sports don’t get much more physical than rugby but players risk their careers fighting on or off the pitch. But in ice hockey, brawls are part of what the fans pay to see. Perhaps they are attracted to the ‘sport’ being so dangerously repressed they have to take out their frustration on cars and store windows when their team loses. Yes, I saw that brawling on TV. Definitely riots from an unexpected quarter. I wonder if some of Vancouver's citizens are thinking of moving across the border to Seattle? So what was staged the riot itself or the photo of the 'two lovers' lying together on the street, with the riot in the background? Or were they both staged?